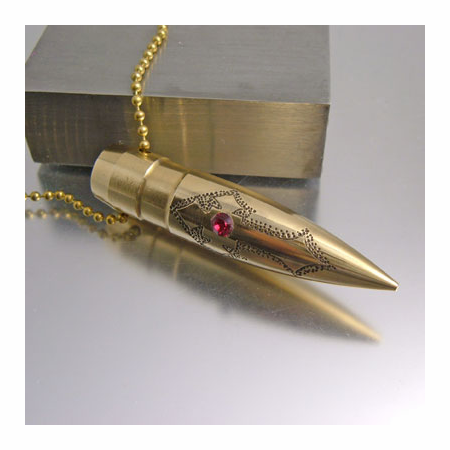 You're seeing the newest, original design style of my .50 caliber collection, released in 2013. 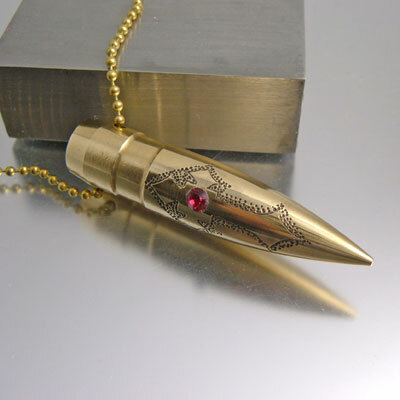 The design is hand drawn then carved; a Swarovski crystal is fitted then set into the solid brass bullet. You will not see these elsewhere these are the first ever made; they are the originals and exclusive. NOTE: The production of certain banded solid brass bullets have been temporarily suspended by the U.S government who has requested manufacturers stop producing and selling them. The .50 caliber is most likely next on the list of bullets to be removed from production and will no longer be available to the public. Own your .50 caliber before they are gone. 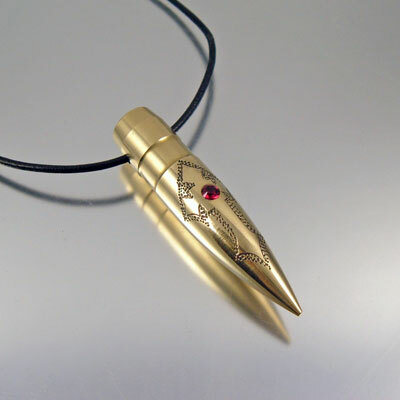 This is an impressive size bullet pendant. Excellent for military, armed forces personnel, shooters and anyone loving big boy toys. You can pick your color of crystal if you'd like me to custom make this or a similar design for you.